WESLEY HILLS – The Antrim Playhouse delivers again with Tom Dulack’s highly laughable comedy, ‘Breaking Legs’ at the small Rockland County Theatre. 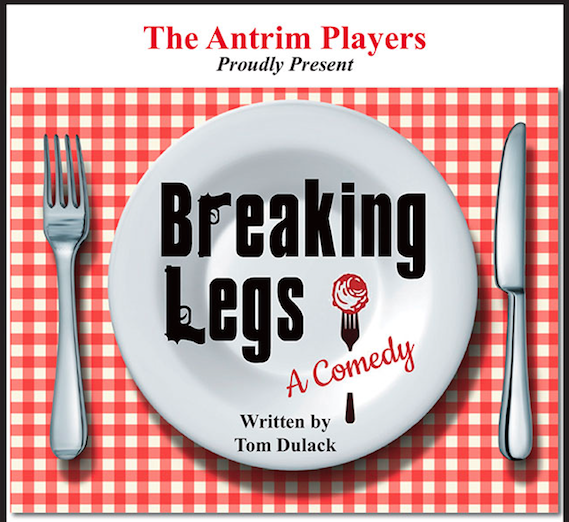 ‘Breaking Legs’ tells the story of the worlds of the Mafia and theatre coming together. When a professional playwright is seeking funding for his play he looks to the “family” of a former student. Terrence O’Keefe, a college professor, (played by Neil Battinelli) has written a play about a murder that has done well overseas, but needs a lot of funding to get it off the ground in the states. He is reminded of a former standout student of his, Angie Graziano (played by Normajean Pfautsch), a waitress at her father’s Italian restaurant, that her father and his friends may be interested in helping. Little does Terrence know what he is walking into, he is introduced first to Angie’s father, Lou Graziano (played by Stephen Moscatello). It doesn’t take long for him to realize that this loud, animated man is really more connected that he would like. You are soon introduced to Lou’s friends and “family” Mike Francisco (played by Michael Gruda) and Tino De Felice (played by Mike Risolo. The comedic pairing of Lou, Mike and Tino, adding in the over-the-top Angie, and very scared Terrence left the audience in stitches. With strong one-liners, a possible love story, and the ever present talk of pasta, ‘Breaking Legs’ is the show you didn’t even know you needed to see. It should also be noted that the crew and production team at Antrim have outdone themselves, per usual, with creating a beautiful set and setting the vibe that audience members were actually sitting inside of an Italian restaurant. From the menu boards and twinkly lights, to the smell of meatballs lingering during intermission, The Antrim Playhouse never misses a chance on setting the scene. ‘Breaking Legs’ will play through April 8th, located a 15 Spook Rock Road in Wesley Hills. For more information please visit antrimplayhouse.com. Additional cast: Franking Salvucci, played by Ken Carman. Crew/Production team: Melinda Pinto, Director; Eric Brown, Assistant Director; Kim Farewell, Producer; Catherine Brunelle, Stage Manager; David W. Julin, Set Design/Set Dresser; Jesse Onderdonk, Set Construction; Jeanette Ruchl, Set Painting; Allan Seward, Lighting/Sound Design; Olivia Rivera, Costumes; Genie Munro, Lobby Board; Behira Alkana, Box Office; Penny Buccafuri, Stage Crew; Doreen DiBenedetto, Stage Crew.